This cocktail party will be hosted by Vicky Bijur and Ed Levine at their Upper West Side home on Tuesday, February 13, 2018 at 6:30 pm. 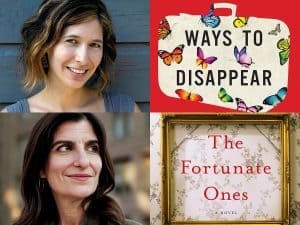 Idra Novey and Ellen Umansky will discuss their bodies of work and their books Ways to Disappear and The Fortunate Ones. Idra Novey is an American novelist, poet, and translator. Her fiction and poetry have been translated into ten languages and she’s written for The New York Times, the Los Angeles Times, NPR’s All Things Con­sid­ered, New York Magazine, and The Paris Review. Ellen Umansky is the author of The Fortunate Ones, which Booklist named as one of the best debut novels of 2017. She has published fiction and nonfiction in a variety of venues, including The New York Times, Slate, Tablet, and the short-story anthology Lost Tribe: Jewish Fiction from the Edge. Entry to this cocktail party will be limited and available by making a donation to PEN America. Proceeds from the PEN America Authors’ Evenings support PEN America’s programming to secure the liberty of persecuted and imprisoned writers around the world, to defend freedom of expression, and to promote literature and international cultural exchange.